This post is way over due, as most of my posts are normally. We visited Cologne, or Köln as it is written in German, on our way to visit friends in Belgium for Thanksgiving (post to come soon, that's right I'm waayyy behind). 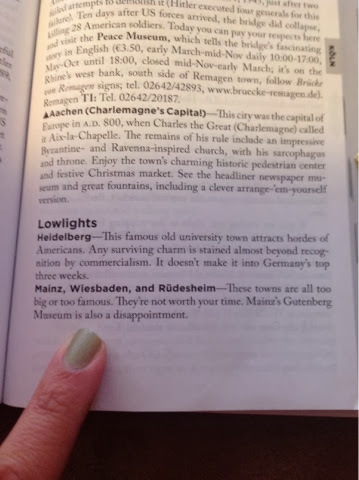 We didn't realize how close this little gem of a city is to Wiesbaden. It's only an hour and a half away! I see a few more trips in our future when the weather is a bit nicer. Here's the Dom in all of its glory. Building started in 1248 but it wasn't finished until 1880. It's the largest Gothic style church in Northern Europe, and its spires are the second tallest. You can't even see the top of the spires because it was such a dreary, rainy, typical German day, but it still looks ah-mazing even without them. The Christmas market is right next to the Dom. Christmas markets are the Germans' way of creating a winter time event that involves drinking. No, not beer but this amazing stuff called Glühwein. It's a red wine with mulling spices and raisins. It keeps you warm on the inside while you look at tons of tiny shops selling Christmas nick-nacks. You can find everything from Christmas ornaments to deer pelts. We had our fair share of Glühwein and fried snacks during the season and are still working off the LBs. Isn't it beautiful? We sipped Glühwein and admired the neo-gothich architecture. You can see a glimpse of the spires now. We shared our first Christmas market with no one other than, drum roll please.....Emma. She loved trolling the ground for food, which has forever ruined her 'heeling' when we visit downtown Wiesbaden. We took turns touring the inside of the Dom, since we had Emma with us, and unfortunately we learned that they close down parts of the Dom during services. I took my sweet time, and poor Sam was rushed out and missed parts of the Dom. Maybe he'll learn from my blog for once. This entryway reminds me of Notre Dame in Paris and the dom in Trier. Not cool Rick, not cool. I guess in his opinion the hot water baths of Roman times with healing powers aren't worth seeing. So, sad. We love our city, Rick! And Rüdesheim is gorgeous too. Remember our visit with our new friends? I'm not even sure if he is thinking logically here, Mainz is where the Gutenberg Press was founded. His books would have never been mass produced without that city. Unfortunately, we couldn't really write him off because that guy really does know how to put together a walking tour. Without him I'd just be wandering around saying, "oh, that's pretty and looks really old" for our whole time in Germany. However, the first letter of his name will forever be replaced with a D instead of an R in our household. Moving on, *ick (I don't know why I can't write that name, since it's actually a real name, but it just seams a bit crude to put on the interwebs) says that this crucifix was the first one to show Jesus dead and not in the usual triumphant or suffering way of crucifixes during this time. It was built in the 970s, some 300 years before it's time in a theological sense. Pretty interesting, huh? *ick Steves wins again! These are the relics of the 3 wise men. This is the most celebrated work of art in the cathedral. It holds the remains of the 3 wise men. These were acquired by Frederick Barbarossa at the conquest of Milan in 1164. In 1864 the shrine was opened and it contained bones and garments. How would I have ever guessed that without the walking tour? I mean it looks really important behind the glass and all shiny, but I would have never known the 3 wise men were right there in front of me! This stained glass is the original glass in the Dom. Like many cathedrals, during WWII the glass was taken down and stored under ground to protect it from being damaged during the bombings. Kölner Dom was hit 14 times by bombs and it did not collapse. One of the last statues you see in the cathedral is one of St. Christopher carrying baby Jesus. It was cool to look up at him and think of the many travelers and pilgrims who passed by him and hoped he would watch out for them. We really enjoyed the Christmas market in Köln, and Emma did too. She did a pretty good job when she saw "friends" around (friend is our code word to each other when we see another dog). And she made out like a bandit with the German old ladies. They loved her "Kleine Ohren" (tiny ears in German), and one woman fed her half of a schnitzel sandwich. Our first Glühwein mug! We're working on collecting as many as we can before we leave. Lessons learned on the blog today, travel with a jacket with a hood in Germany to prevent wet hair and don't go anywhere without *ick's books. 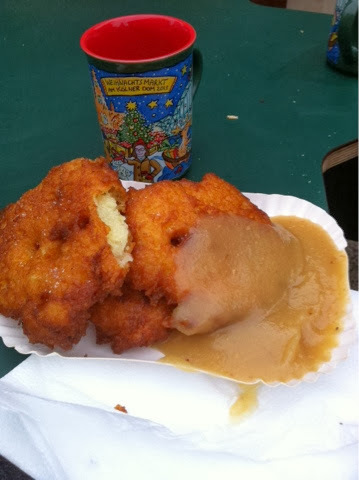 Maybe we can trade some of your Beef and Leaf for some potato pancakes and Gluhwein? I'll say a special prayer for you with the wise men next time I'm there. Somewhere along the lines of potty training and more wine! It looks like we're sharing a duty station. 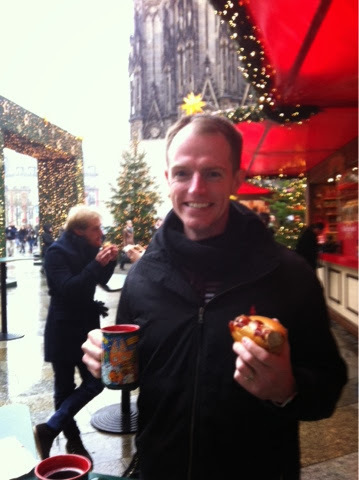 I visited the Cologne Christmas markets, as well - so much fun! And isn't the Dom incredible? 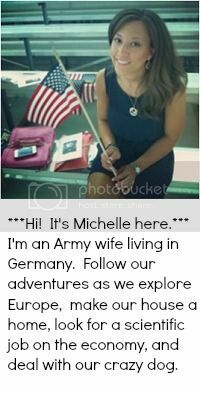 I'm glad I stumbled on your blog today - looking forward to following. Yay! I'm glad you made it to Cologne! My pictures don't do it justice, right? This duty station is perfect for travel. Sounds like you're making the best of it!